The transformation is just about complete and I am back to work in a freshly decorated and refurnished work room. There is now plenty of room for Angus and Mr Bond to join me, I chose a large curved corner desk to provide plenty of space to lay things out and this also creates a very cosy shelter for the dogs. Barely a month ago it looked like this, gloomy and the last room in the house after 12 years which still had the previous owners wallpaper. It had become an unhappy place and associated with some times which were, let's just say, not the best I have known. So to strip it out to bare walls and replace every thing from the floor up was very cleansing and symbolic of the fresh start I have made. It looked very sparse when first finished and I kept it that way while I decided exactly what was going back in, most importantly it had to be quick to clean up and everything had to be put away so Mr Bond, who is now a very inquisitive large puppy, could not get hold of anything which might hurt him. I have missed canine company while I work, I couldn't leave the pup alone downstairs so Angus had to stay with him too and I have been very lonely working in there without them. It is a pleasure to be in there now and I have enjoyed a happy first week of bear growing with my canine companions, they sleep most of the day and it is all too tempting to rest my eyes and join them during the afternoons. 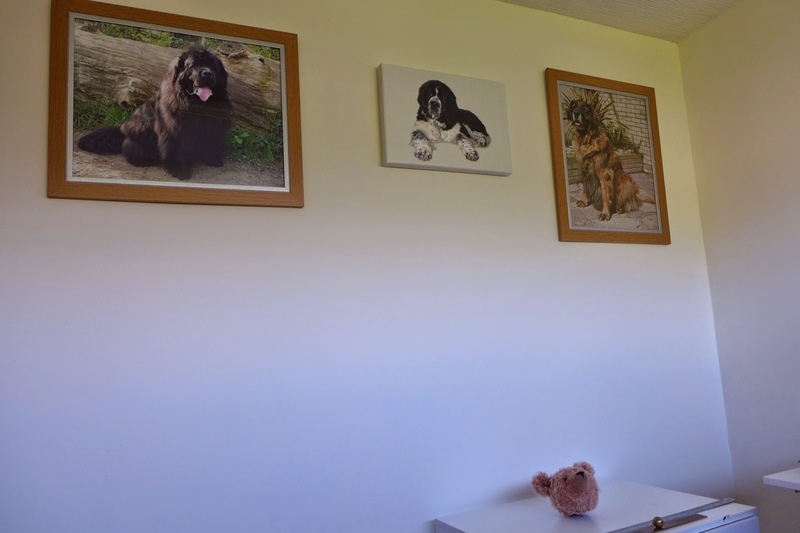 The one thing that was missing was something of the dogs who have departed, so I have used the blank wall opposite the window to hang pictures of them. Hugo is there of course, he will always be part of my work as my website bears his name and I have also decided to mark this new phase by using Hugoshouse as my business name. Posh is there too, both of them spent many hours at my feet while I worked, and of course Buster's picture is also there. Poor Buster was never actually able to climb the stairs so he never shared the work room with me, and I confess now that I came to resent hours toiling away while I knew he was downstairs, I was on a roller coaster of editions and orders to finish just when he needed more and more care. So my lovely boy has joined us and many thanks to Malcolm for extracting his image from a cluttered photo and making a canvas print for me. There we are, I have never really had a work room just to suit me with things chosen just the way I want them, I have made do, and yes there is merit in that and of course I have made some lovely bears over the years but I finally decided that if I were to continue I had to have a special place to spend all those hours. I like it so much that I went in there with the boys this afternoon just to kick back and relax. Looking forward to better times ahead, now that I am on my pension I thought I would be making less bears, but at the moment my bright new work room seems to be helping the creativity flow so I might even end up making more if I don't "relax" too much after lunch.